We often hear high praises from our guests about George, and they are well-deserved. And the mention of our friendly residents is music to our ears. Yes, there’s no stand-alone recreation hall, but a large room off the manager’s office is home to some pretty lively bingo games and the firepit gets quite a workout during season with cookouts, cold beer, and live music. Floridays is located in Hobe Sound, a small “old Florida” town built along the historic Florida East Coast Railway built in the late 19th century by Henry Morrison Flagler, a Standard Oil magnate. Flagler saw the potential of tourism along the east coast of Florida and built the railway to turn his vision into reality. Nowadays, the entire eastern seaboard is crowded and overbuilt—except for Martin County, and especially Hobe Sound. This bit of history explains why the reviewer noted the long trains that rumble through our town. Hardly noticeable by day, It can be noisy at night, but it can also be a comforting reminder of small town America and days gone by. As our trees and other new landscaping plants continue to grow, the trains become less noticeable. It’s an honest review, and we invite you to read it. We’re happy it mentions our squeaky clean, brand new humongous laundry and shower building (we call it the wash house) that now is fully functional with good water pressure. Our wifi is excellent, and our weather pleasant, even in summer. 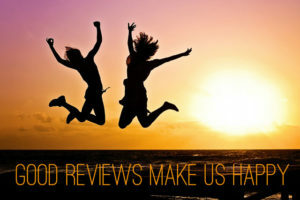 If you were a Floridays guest this summer, please consider leaving a short review on our Facebook page or at one of the review sites shown below.